Since most countries specify white backgrounds, do not wear a WHITE shirt, blouse, or white jacket, to allow for sufficient contrast with the background. Do NOT apply shiny skin moisturizer or shiny make-up to your face the day of the photo session, as your face will look very shiny, which will cause photograph rejection by authorities. Not even 'just a little'. Do not wear turtlenecks because your neck must be visible for biometric data scanning. Cover your shoulders so you look dressed when the photographs are cut to size. Uniforms, clothing that resembles uniforms, and camouflage attire are forbidden by most countries.Avoid wearing earrings and facial piercing jewelry. For Philippines passport and USA Green Card, wearing earrings is forbidden. It’s smart to remove eyeglasses because glare will cause photo rejection. Glasses with tinted lenses are prohibited. For the USA, French visa and the Mexican passport, eyeglass removal is mandated. Head coverings are usually prohibited unless you have a religious exemption granted by government authorities. An exception: Iranian women’s passports. If you ignore the above recommendations, Timothy Raab will not guarantee acceptance of your photos. Your passport photographs may be with you for a long time [10 years? ], so let’s be prepared for a better passport photo. Wear simple and basic clothing with solid colors, avoiding loud, busy, or new trendy patterns, as well as name brand logos. Many people opt for blues and medium tone grays. Avoid fluorescent/neon colors because they reproduce poorly and detract from the face. Please do not wear white shirts when photographed with standard white backgrounds. It’s smart to dress conservatively for required government photographs. Take heed to avoid getting sunburned before your photo session. Get your hair done if you like, but nothing flamboyant. You may wear long hair down, but it must not cover the face. Make-up: Keep it minimal and matte toned. Avoid shiny lip gloss. Please do not apply shiny facial moisturizer. Avoid big hanging earrings, and chunky or shiny/sparkly jewelry. Aim for looking like you’re ready for a job interview, not a party. Finally, neutral and pleasant expressions are better than “not smiling”. ENDORSEMENT RECEIVED April 4, 2017 : "The comfortable, relaxed setting and the confident, reassuring attitude made getting a passport photo an enjoyable experience. 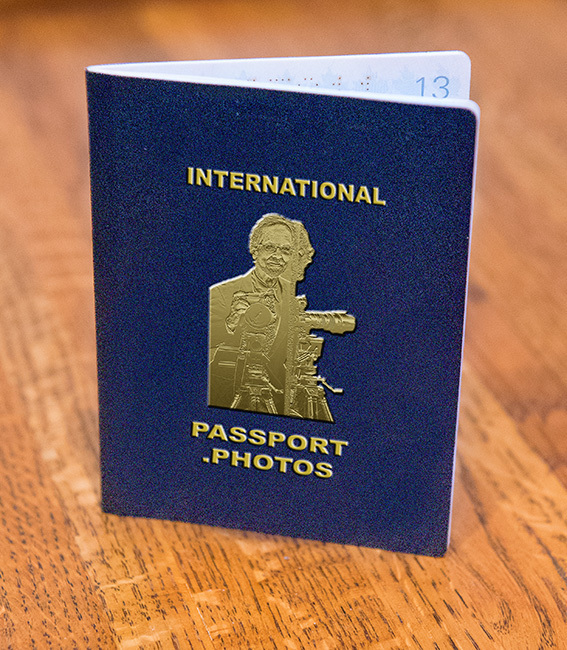 I have a flattering passport photo that meets every requirement, no worries about getting it returned. Glad I didn't go to a chain store for it."